Hummingbird Biscornu [C7181] - $6.00 : Yarn Tree, Your wholesale source for cross stitch supplies. Cross stitch pattern from Tiny Modernist. 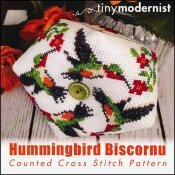 Look at these beautiful hummingbirds stitched on this biscornu! Stitch count 67h x 67w.